look what turned up in an antique shop in edmonton! of course, i snapped it up this time and can't stop picking it up and running my fingers over the glaze. 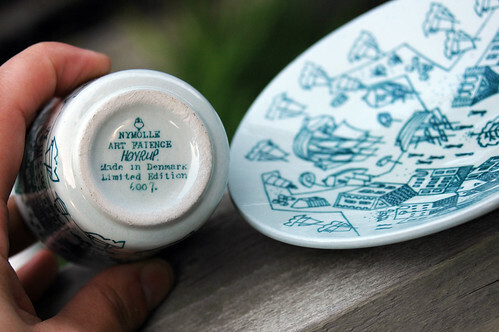 here's the mark on the bottom of both the cup and plate. a quick search on ebay found quite a few of these little babies for as low as $2.99 so get on over there and grab one for yourself - it's wee but oh, so lovely! i have done such a crazy amount of shopping in the past four days, it's completely ridiculous! but i'm having such fun and, as shane said when i talked to him today, that's all that really matters (until he sees the visa bill). i hit a fabric shop today and, while i didn't actually buy any fabric, they did have lovely quilting thread on sale - by one, get two free. yes, please, i'll take 12. THEN, i found a little rack of Clover goodies, all marked 50% off! i went a bit crazy and bought multiples of the 3/4" bias makers and these neat looking rotary "slashers" which i think i'll have to experiment with to explain in any way. i thought everyone should benefit from half price clover so i'll be putting a few into my esty shop later this month - once i get over playing with mine! Great to hear that you are having so much fun- can't wait to see your stuff when you get back. yay for the cute cup and saucer! I love your little cup and your blog! what a gem! nothing better than crazy shopping, enjoy! 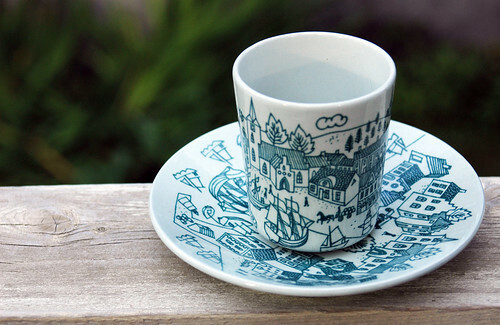 I love that cup & saucer! Oh, how I love the cup and saucer! like something I wish I'd drawn! Edmonton, Toronto! Hey, I just came over to your blog (via decor8, who else?) and read a few posts and discovered a Canadian in our midst. Yay! I live in Calgary, ex-Toronto, ex-Montreal, etc. Love your blog and will do some catching up soon! Nice to find you - there aren't nearly enough of us here...!! What an awesome snag at the thrift store. Thanks for reminding me - i need to go check out mine!